I was searching through some old emails and came across an email I sent my sister while we were volunteering in Borneo with orphaned orangutans. I wish I had a picture or video of this to share how adorable it was! GENJI and ALAN were sooooooooooooo funny yesterday. oh man! i wish you could have seen it. i was dying laughing. we were supposed to do nest buildling with them but after like 10 minutes its started raining so we brought them back in there cages. but felt it was a waste abandon all those good leaves. so we piled ALL the leaves in their cage. Genji tried to build nests, but Alan kept knocking them down. Eventually Alan got on one of the platforms and started furiously shaking at this huge leave stick thing (it reached from like floor to ceilling) but he shook it too hard and fell off the platform onto the ground. Luckily the ground was covered in leaves so he didn't hurt himself. so they both found this discovery very amusing. Genji then turned over the laundry basket to make a platfrom they both kept jumping off of it and plopping onto the ground like kids jumping into leave piles it was sooo funny. They were getting such a kick out of it and having so much fun it was so cute. 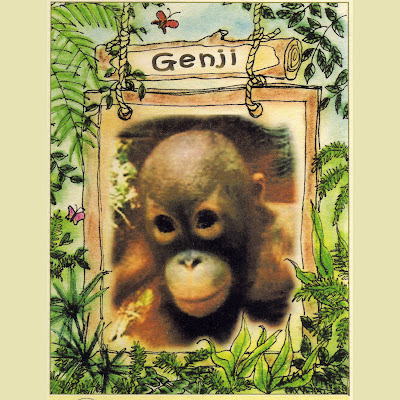 Genji is female orphaned orangutan and was 3 years old at this time. She was one of the best nest builders I came across while volunteering, especially for such a young age. She was a funny little girl. 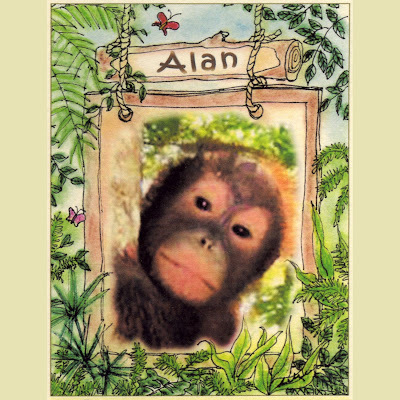 Alan was male and also 3 years old at this time. Alan was a little shy but super sweet. Orangutans sleep in nests at night. They would normally learn how to build nests from their mothers. So one of the activities we did often with the orphans was nest building, since it was something they would need to learn before being released into the wild again. Without the protection from their mothers, young orangutans are very susceptible to catching cold when it rains. That is why we usually bring them in when it is raining and try to give them indoor enrichment activities. Here is a picture of a young orangutan building a nest.